MobilityeCommerce is an integrated marketplace and ERP solution offered as a SaaS for distributors, wholesalers, drop shippers, and companies that sell on a global scale via online marketplaces such as Walmart. Sears, Amazon, eBay, and more. The software provides users with immediate and unhindered access to the most popular e-Commerce channels around the world. With an intuitive interface that delivers a unified view of your business, you can quickly check your inventory and manage all aspects of your business with unparalleled flexibility and simplicity. Apart from the leading online marketplaces, MobilityeCommerce integrates with the most popular and widely used business apps such as SAP, NetSuites, Sage, QuickBooks, Oracle, and more. MobilityeCommerce provides a SaaS-based enterprise solution that powers online businesses that sell via online marketplaces forward. 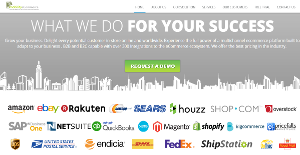 The software boast of over 300 integrations with the most popular digital marketplaces (eBay, Amazon, Rakuten, etc.) and widely used business systems (QuickBooks, SAP, Oracle, etc. ), giving you the leverage you need to fully manage your business and drive revenue and growth. Catering to wholesalers, distributors, retailers, and manufacturers, MobilityeCommerce gives them a comprehensive ERP platform that allows them to simplify their tasks while improving their effectiveness and efficiency. The software is a great tool for making product marketing easy and in generating precise accurate sales forecasts as well as financials and accounting. With MobilityeCommerce, you can always be sure that you are providing your customers with the best-recommended products based on what they need, their history, their tendencies, and more. The platform does that via enhanced customer segmentation and machine learning, resulting in accurate product and behavior prediction. Utilizing artificial intelligence, MobilityeCommerce allows you to gather high quality and very actionable customer insights. This enables you to understand your customers better so you can create a tailored experience for each and every one of them. The information you get also helps you create and implement effective customer retargeting strategies, efficient sales process, and more. What Problems Will MobilityeCommerce Solve? 1. It automates all processes for faster, more streamlined workflows and functions. 2. Accurate prediction and personalize recommendation: This feature was on more demand from our customer, they wanted to get an accurate prediction about the sales, order and financial calculation. 3. All features at one place, including Listing Management, Order Management, Refund & Case Management, Product Catalog Management, Fulfillment & Shipping Automation, Inventory Management, Warehouse Management and Drop-shipping & Sourcing so that can provide all service with one platform. Every enterprise has its own characteristics, and might call for a particular type of Accounting Software solution that will be fit for their company size, type of customers and employees and even particular niche they deal with. You should not count on locating a perfect app that will be suitable for every business regardless of their background is. It may be a good idea to read a few MobilityeCommerce reviews first and even then you should pay attention to what the software is intended to do for your company and your employees. Do you require a simple and straightforward service with only essential functions? Will you actually make use of the advanced tools required by pros and big enterprises? Are there any specific features that are especially beneficial for the industry you work in? If you ask yourself these questions it is going to be much easier to locate a trustworthy service that will match your budget. How Much Does MobilityeCommerce Cost? We realize that when you make a decision to buy ERP Software it’s important not only to see how experts evaluate it in their reviews, but also to find out if the real people and companies that buy it are actually satisfied with the product. That’s why we’ve created our behavior-based Customer Satisfaction Algorithm™ that gathers customer reviews, comments and MobilityeCommerce reviews across a wide range of social media sites. The data is then presented in an easy to digest form showing how many people had positive and negative experience with MobilityeCommerce. With that information at hand you should be equipped to make an informed buying decision that you won’t regret. What are MobilityeCommerce pricing details? What integrations are available for MobilityeCommerce? Pros: I think one of the good company for seller like us who is looking a complete solution for our web store. We can integrate our web store with ERP like NetSuite, SAP and also integrate with all major marketplaces like Amazon, eBay, Walmart etc. The features like Inventory software, order management, listing management, Drop-shipping, fulfillment, and warehouse management you can get it one place. Cons: We have faced little issues with tools to understand and use them, I think they should would on that to make it better. Pros: The best aspects of this product is his all-in-one solution for our business and at one platform you can sell your products on Amazon, Walmart, eBay, houzz, sears, jet and 10 more. After the market searching for that right tools for our business we stumbled on mobilityecommerce. This is really amazing that i can get all my business requirement features like Fulfillment, Listing Management, Order Management, Product Catalog Management,Warehouse Management, Shipping & Sourcing Management and Freight Management from one platform. I also integrated my webstore with NetSuite that is the great advantage, apart from the product functionality like automation, AI really cool to go insight our sales, order and shipping for monitoring my all business aspect closely. the Automation functionality really help our business to eliminate duplicate data as well making everything automate like uploading, report downloading, fulfiilment and more. If you need more information about MobilityeCommerce or you simply have a question let us know what you need and we’ll forward your request directly to the vendor.